Skogafoss is the waterfall that inspired me to visit Iceland — seriously. I saw a picture of this epic monster on the internet and decided I had to go. It’s almost impossible to take a bad photo of Skogafoss (pronounced ‘skoa-foss’). Everything about it is perfect, from the black volcanic sand on the shore, to the solid sheet of water raining down between green cliffs that look like they came from a fantasy movie. The size of Skogafoss is impressive too. It’s about 200 feet tall and 80 feet wide, making it one of the taller waterfalls in Iceland. This is a very powerful waterfall with a lot of mist, so during sunny days you can almost always see a big rainbow here. Waterproof clothes can be handy if you want to go take pictures near the waterfall. You WILL get drenched if you try to get within 30 yards of the falls! There’s an old Icelandic legend that says one of the first Viking settlers hid a treasure chest of gold behind the waterfall. Be sure to climb the 500 steps up to the viewing platform above the waterfall too! This gives you some other perspectives, including a nice top down view of the falls and cliffs. In the winter this path can get slippery and dangerous, so it’s better to use it in the summer. 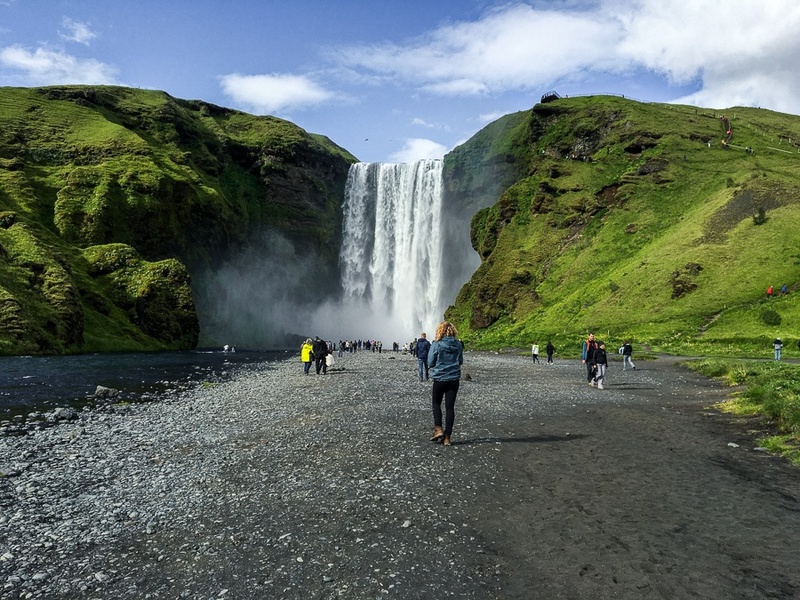 Skogafoss is about 90 miles (150 km) from Reykjavik, so it can easily be done as a day trip, along with Seljalandsfoss and some other nearby attractions. No hiking or entry fee is required to visit Skogafoss. Near the waterfall parking, there’s also a restaurant and museum that may be worth checking out. While you’re at Skogafoss, consider visiting Kvernufoss too. This is a less known 100 foot tall waterfall not far from Skogafoss. The 20 minute hike from Skogar to Kvernufoss is a scenic walking path through an incredible green canyon that looks like something out of Lord of the Rings.